Your Hindu articles and Isai Payanam series program videos have helped me become a better rasika. When I hear about child prodigy famous artists being able to identify ragas at the age of 3 and I sometimes have difficulty in even identifying Shanmugapriya when the alapana starts, it is somewhat discouraging. I have seen many kutcheri attendees looking up a 'raga reckoner guide book' when the artist begins the Pallavi line ... they are probably frustrated in not knowing the raga when the alapana starts and hence do not concentrate much during the alapana stage and may instead tend to chat with fellow attendees. I am talking to other rasikas like me (who are not experts enough to be able to know all the technicalities to be able to write a concert review but enjoy carnatic music with some basic ragas knowledge thanks to informative, educational and entertaining productions by artists like you which helps us keep improving our ability to appreciate the finer aspects of ragas ) to see if a Youtube based series aimed primarily at rasikas who may or may not want to be able to sing for others will help. What is the minimum basic knowledge the raikas need which will make them interested in listening to the whole concert with concentration and get the most out of the experience even if they cannot identify the ragas?...often breaking one's head with the raga identification process may take the mind away from enjoying the music . 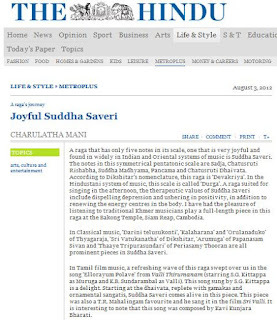 As an example, in the Raga journey article on Suddha Saveri article you mention the importance of gamakas to bring out its raga swaroopa . An audio or video demo clip to show this effect will help a rasika like to play a concert CD alapana and look for where/how thar artist uses manodharma and gamakas for the raga. I enjoy reading your column in The Hindu. I am not sure why you have not mentioned the classical "Thendralil Aadum Koondhalai Kanden ...." , sung by Vani Jayaram and KJY of MSV , from the last MGR film Maduraiyai meetta sundara pandian . This is a ragmalika song with pallavi and a full charanam in Suddja saveri , followed with Abheri and Charukesi. We generally note your coverage on MSV songs is little inadequate. For example, in your coverage of Sahana, there is no mention of "Aadinathan Ketkinran" sung by TMS and S Janaki , in the film Ganga Gowri, again a classic from MSV . This song is a full length classical piece steeped in Sahana. This movie of Great MSV covered Anandabhairavi, Bagesri, Charavaham apart from Sahana. Pl let us know if more details are needed. "Thedralil aadum" tends more towards Aarabhi due to usage of the nishada and the gandhara in descent. I purposefully omitted this in Suddha Saveri..It is a lovely melody, but cannot be classified under Suddha Saveri in my opinion. I shall definitely include more of MSV songs. A Small correction to a point in your Isai payanam video which I humbly want to place here. Malargalil adum ilamai puthumaiye of Kalyanaraman is not Shuddha Saveri but entirely in Mohanam. RADHA RADHA NEE ENGE- is likes mohana raga. Pls clear my doubt. it is sudha saveri or mohana raga. I think the song Udhadugalil unathu peyar ottik kondadhu , a relatively unknown song from the film Thanga Rangan , Kannile kudiyirundhu from Imayam , one song ( I don't remember the Pallavi ) from the film Deiva thirumanangal are also inSuddha saveri . Need clarification, if the immortal Indru namadullame of Thanga padumai has Sudhdha saveri shades.